Obviously, I’m feeling a bit emotional; male menopause, perhaps. More likely, my feelings for the lil’ woody were heightened by shooting a superb original ’55 Ford Fairlane yesterday. The owner’s son happened to be in town to visit his ninety year-old father in the nursing home. The father bought the Ford new, and the son, about my age, had learned to drive in it. And now he was preparing himself to say goodbye to both of them. That’s how it often is with old cars. They’re like sponges, dripping with the human emotions we’ve invested in them. As the unofficial chronicler of old cars in Eugene, I feel like I’m taking a lot of it on, like a shepherd watching over his flock. I’ve photographed over five hundred in the past six months, and in the process we become intimate. When I see them coming and going, or just sitting on the streets, it’s a little like running into an old girlfriend: is your driver treating you well? Has he noticed your balding front tire and your oil leak? I have no choice but to internalize all this; it’s a heavy burden. So why the big love for this particular Datsun? Well, it was a perfect golden summer evening, and I was biking around the Whiteaker district. The Whit is by far the most colorful neighborhood in Eugene: a mixture of aging hippies, meth heads, hip young adults, idealistic families, the Ninkasi Brewery, recent Mexican immigrants, the Pizza Research Institute, Sam Bond’s Garage and the Arcimoto EV start-up. You get the picture. It also has a unique zoning status that allows small business and residential housing to mix. My mechanic’s busy little three-bay shop is attached to his house. Actually, two of them are the original double garage. Instead of a waiting room, you can sit in his wife’s rose garden. Some of my best finds, like the Vega wagon, were found lurking around here. In fact, I had just discovered the 1950 hot-rod Cadillac down the street minutes running into this Datsun. Very anti-climatic after that awesome find, and I almost decided to pass on it. It’s hardly the only 210 around. But it called out to me; the setting sun reflecting off the bright yellow house, the lush garden, and the way the vinyl wood appliqué was deteriorating, like alligatored paint on an old house. 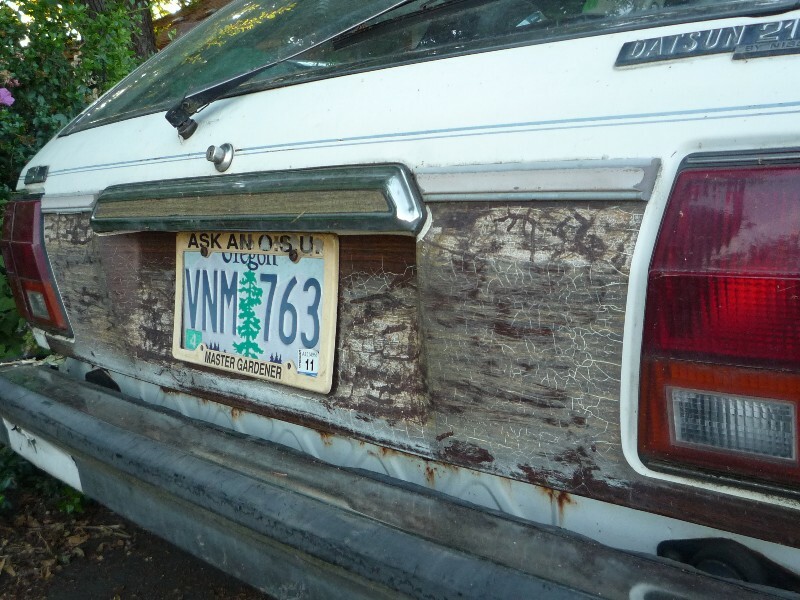 And just as the paint on a house flakes worst on the sunny south wall, the “wood” on this Datsun was clearly worse on its south-facing tailgate. It’s obviously been living here for a long time. As I was shooting it, a bright and delightfully engaging girl of about eleven came riding out the driveway on a unicycle. I told her I was a unicyclist too, and we struck up a conversation about the pros and cons of 16” versus 20” unicycles. She confirmed the Datsun’s status as a reliable but little-used long-term family member, due to the family’s primary transportation being pedaled devices, one and two-wheeled. As I stood there talking to her, I suddenly had the sensation that I was in a different country, perhaps Mexico, or Cuba. I felt thankful to live in a place where the old cars and the kids aren’t all hidden away in three car garages or MacMansions in gated “communities”. 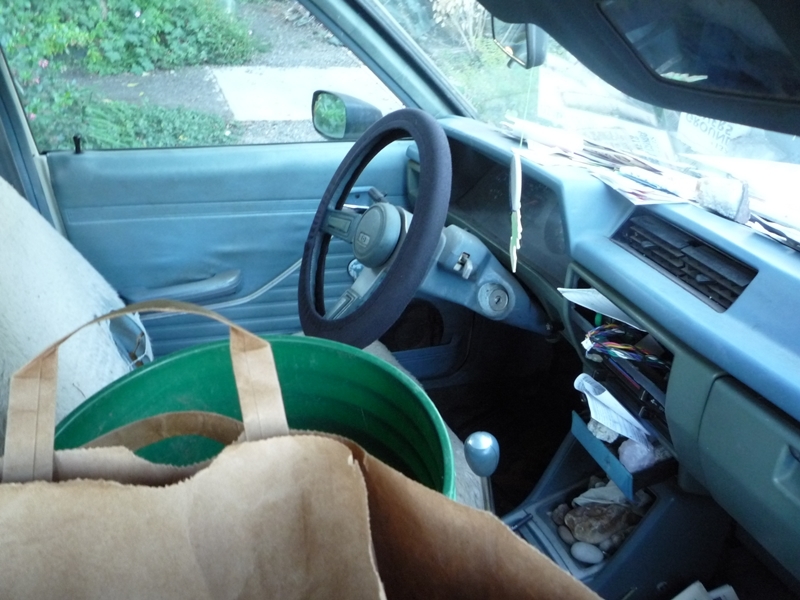 Where an old Datsun wagon can live out a long and useful life hauling gardening supplies when needed. In a different mood, I might have thought about Clarkson’s catapulted Sunny and chuckled. But not that day. It probably won’t come as a shock if I tell you that most new cars don’t do a whole lot for me these days. The exception to this are the developments in new technologies and propulsion systems. Well, that and the Alfa 8C that haunts my dreams. But there’s no doubt that we’re in the early days of a transitional period. It’s like the end of the steam locomotive era, or the horse and buggy. So I find myself with one foot in the future, and the other in the past, documenting and reveling in the era when cars were far less perfect, but had character, and are now sitting decoratively at the curb in front of a vintage house. Being an optimistic futurist as well as a nostalgic historian is my way of coping with the muddle of the present. Transportation wise, the Whiteaker is a melange of bicycles, at least one unicyclist, pedestrians, old cars, trucks and a few EVs. Newish cars? Except for Priuses, not so much. Is it a sneak preview of our future? Works for me, especially when I get to meet a hot rod Caddy, a fellow unicyclist, and a Datsun 210 woody wagon within the same two blocks. Thanks for tolerating my middle-aged digressions; I’m feeling better already. And I promise you a slew of truly awesome vintage Datsuns to come. Speaking of which, I’ve barely said a thing about this Datsun; my apologies. It was a primitive but fundamentally rugged and cheap workhorse of the era. It really hadn’t changed much since its origins in 1966 as the Datsun 1000. RWD, the simple little A-series push-rod engine, the same old tired formula that the European FWD hatches and the Honda Civic made obsolete. By the early eighties, it was a rolling relic. Deadly boring. Maybe even the worst car in the world. But most worthy of love and a Curbside Classic. Great storey Paul, and you’re fortunate to live in the automotive time warp that is Eugene. There must be more folks out your way that are comfy with their old tin, instead of feeling the need for big payments and the latest CUV. It is terrific to see you back writing. Ever since I stumbled upon the TTAC website sometime a couple of years ago, I have enjoyed all aspects of that site. The CC’s were certainly an important component of that enjoyment. It was different when you went on your first sabatical and there were no new time warps to enjoy each week, and it was a thrill when you returned. As a son, a father, a lawyer, a CPA, and an old car enthusiast (I own a 1991 Colony Park and a 1983 RX-7) I am disappointed to see the little rift that prevents this site from obtaining the other treasured writings from the past. I understand splitting off into a separate website devoted to your passion, allowing TTAC to remain focussed on its more primary mission. I would hope that the editor-in-chief of that site finds that it is really quite silly to hold those archives hostage. Do a quick google search of curbside classics and see how many websites have your writings posted. I was astonished the past three weeks what I was finding. the other editor should move forward in confidence that his mission and your mission can both be accomplished, successfully, and without petty nonsense. We are guys after all, not cats. He should be strong in the belief in what he is doing, and recognize that both can co-exist happily. I for one still visit TTAC, because it provides the writings and analysis of current events that are making news today. CC is about the past. It is about taking a stroll down memory lane. It is an altogether different adventure. Bottom line, his holding the archives hostage I find to be petty and will make me think a little bit less of the integrity of that site. Good luck with the new endeavor. It has been a joy to read the past few years, and I look forward to the future. P.S. Besides, I want to see the RX-7 CC on this site :o) Love the rotary! Joe, Thanks for your comment. The problem is that TTAC’s owner, Vertical Scope doesn’t want to give up a valuable asset that continues to drive traffic to their site. It’s not an issue that the Editor (son Edward) has much say over, as far as I know. I will eventually rewrite most of the significant CCs and bring them home, one way or another. Thrilled to hear it is not a father-son matter. In my line of work I unfortunately see way too much of that type of thing, father-child, siblings, etc., and it is really sad to see. I’m glad to see I’m not the only one. Well, not documenting so much, but definitely reveling. Even though I may not be a fan of the classic shown, the tidbits in the story are what I enjoy most. The part about the father and son and the ’55 Ford, are gold to me. Even though my father passed when I was a teen, we shared our passion for all things mechanical and electronic. Well said. It’s getting harder and harder to find interesting cars that are easy to live with that were produced in the last few years. Even the much-loved (and much-reviled) BMW 3-series has succumbed to technological overkill with batteries that require $500 of mandatory dealer service to change and add nothing of value or function to the vehicle. 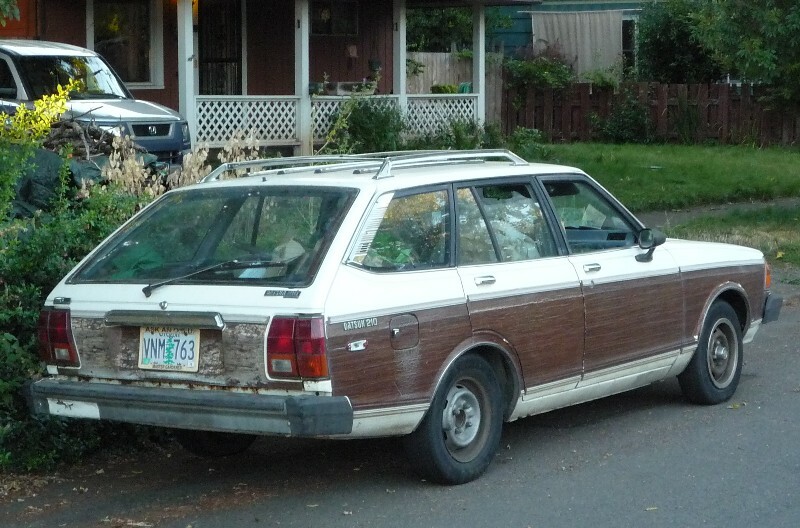 Any Japanese station wagon with woodgrain is automatically cool. 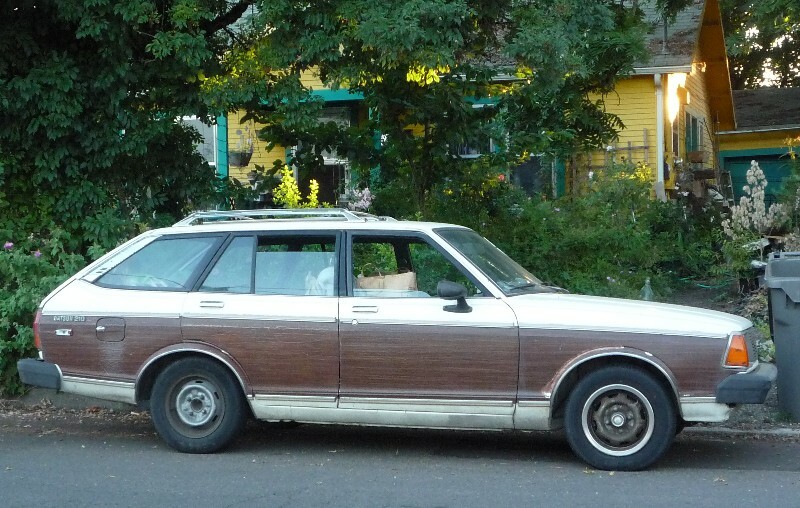 Here in Savannah, GA someone has a 1980-ish Cressida woody. I think it’s fair to call it a Sunday car because that is the only time I ever see it, parked near a downtown Lutheran church. What a great surprise to find images of this car online. 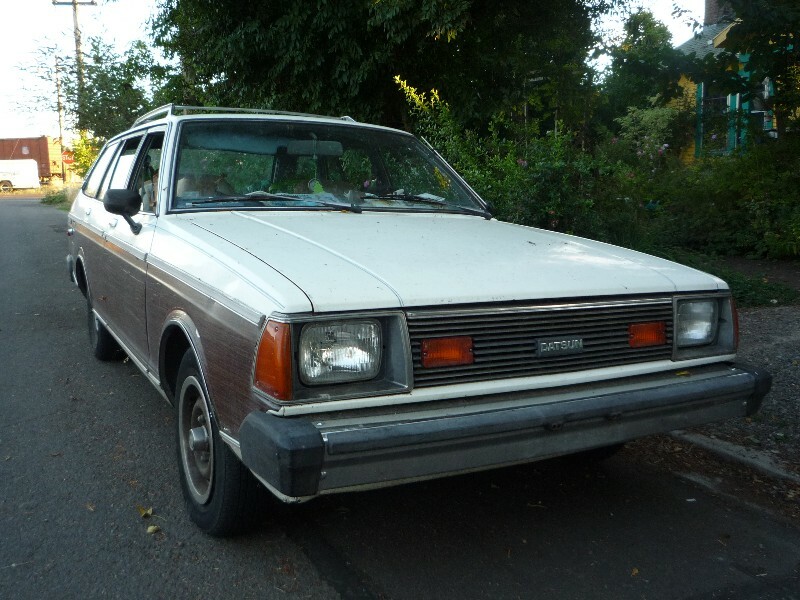 It happens to be the very same Datsun I own, right down to the color and the faux wood panelling (only this one is in Eugene, and mine is in Portland). My little Datsun-That-Could brought me to the Pacific Northwest, fully loaded, with nary a fuss, and continues to go strong. I’m very happy to have found it, and even happier to have had the wits to buy it. Thank you for posting this! We should start a social club of Datsun owners in Oregon: fun driving outings to national parks, the coast, etc. Very cool to see this window into the early days of the site, from the perspective of the fifth anniversary! Still a well-written article, and I echo your feelings about the Datsun–a dreadfully boring little car when new, but its survival for all these years validates it somehow. 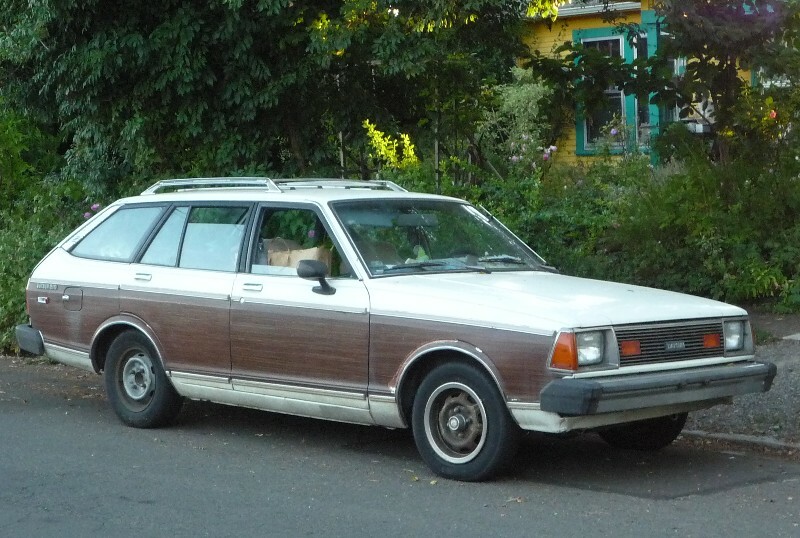 Plus an old Japanese econobox wagon with fake wood gains a ton of cool points anyway. Wonder if this one is still lurking around? If seldom used but maintained, it certainly could be. The unicyclist would be almost enough to drive it now!